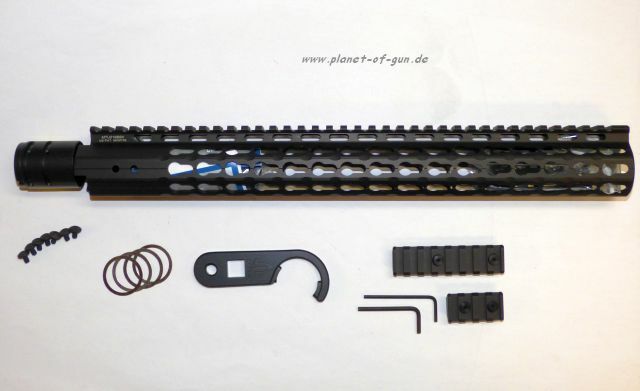 HERA IRS Keymod Vorderschaft für AR15 Waffen in Länge 15"
Der Hera IRS KM (Keymod) Handschutz wird auf modernsten CNC Maschinen aus Aluminium gefertigt und anschließend harteloxiert bzw. Ceracote beschichtet. Er setzt in Hinsicht Stabilität und Optik neue Maßstäbe und eignet sich ebenso zur Aufwertung Ihrer Waffe, wie auch als Standardhandschutz für einen Neubau. Im Gegesatz zum IRS wurde eine Gewichtseinsparung um 50% erzielt. 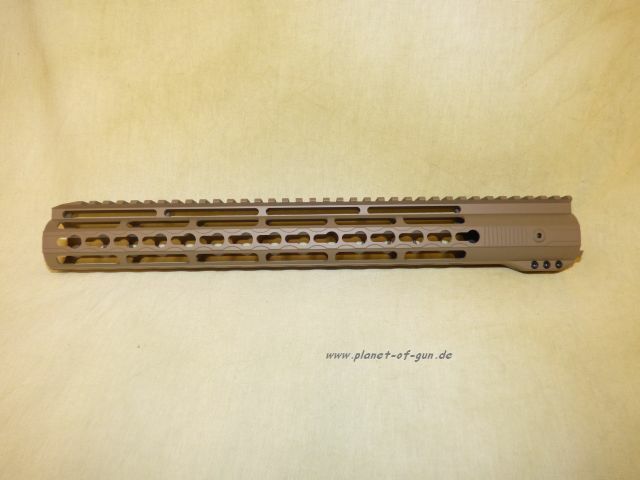 Durch die Anordnung der Keymod Aufnahmepunkte auf 3, 6 und 9 Uhr können alle handelsüblichen Keymod-Zubehörteile montiert werden. 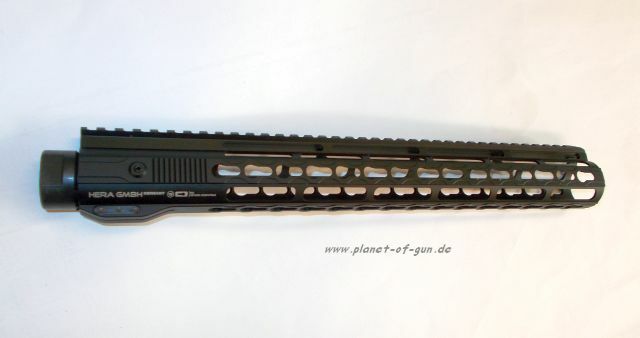 HERA IRS Keymod Vorderschaft für AR15 Waffen in Länge 12"
HERA Sport 12" Vorderschaft mit 11 Keymod Basen unten am Schaft, oben Picatinny Rail fürs Korn - sonst komplett geschlossen! 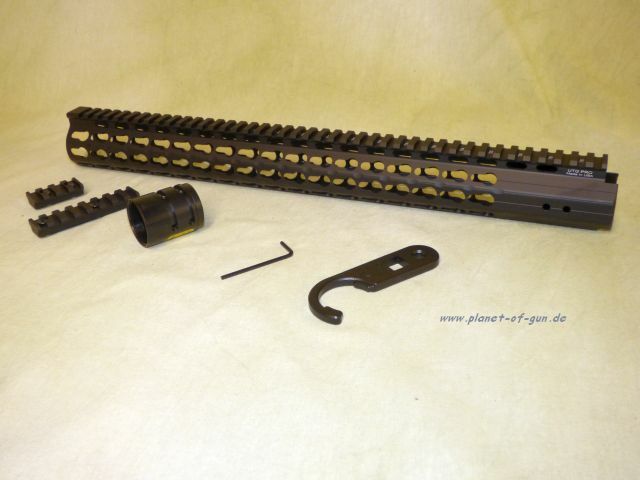 The NOXs™ handguard was designed as an alternative to the outdated, bulky options of the past. Engineered as a lightweight, ultra-thin platform, the NOXs™ handguard is only 1.5” wide. Each NOXs™ handguard will be available with the KeyMod mounting system at the 3, 6 and 9 o’clock positions throughout the length of the rail, allowing the user to customize their platform with accessories as needed. Anti-rotation QD sling attachment points are milled directly into the hand guard, as are cooling slots, providing maximum airflow and preventing the barrel from overheating during prolonged periods of shooting. The NOXs™ handguard comes equipped with a Patent Pending Cross-lok™ mounting system. This system ensures that anti-rotation is built into the steel barrel nut as well as the handguard making installation simple and rock solid with just basic hand tools. The NOXs™ handguards are Type III Hardcoat Anodized, matte black and available in 9, 12.8” or 15” lengths for the AR-15 Platform. As with all Seekins Precision handguards the NOXs™ ships with all of the needed hardware to mount to a standard upper receiver. 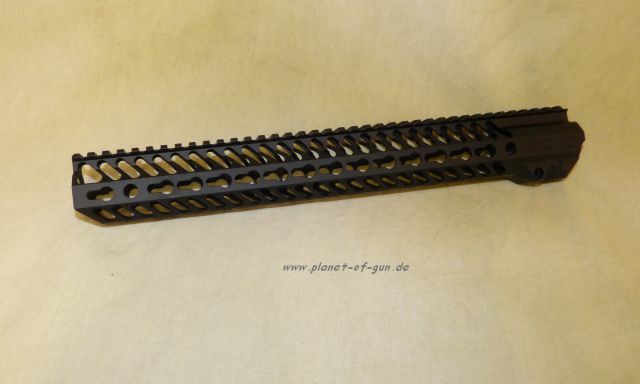 Width 1.50”; Inside diameter 1.350” 9” Handguard: Overall length 9.125” 6.1 Ounces 12” Handguard: Overall length 12.875” 8.0 ounces 15” Handguard: Overall length 15.0” 9.2 Ounces Barrel nut and mounting hardware: 2.6 ounces. 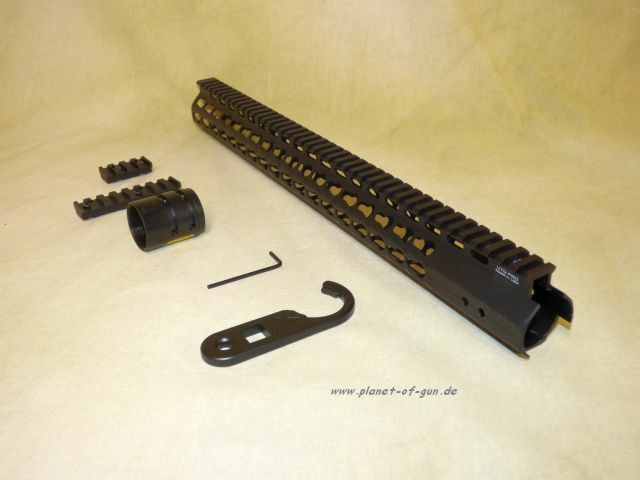 YHM is very proud to introduce our newest line of AR-15 handguards, the SLR (Slim, Light, Railed) series. These handguards were designed to address the two main customer requests regarding current handguard models. 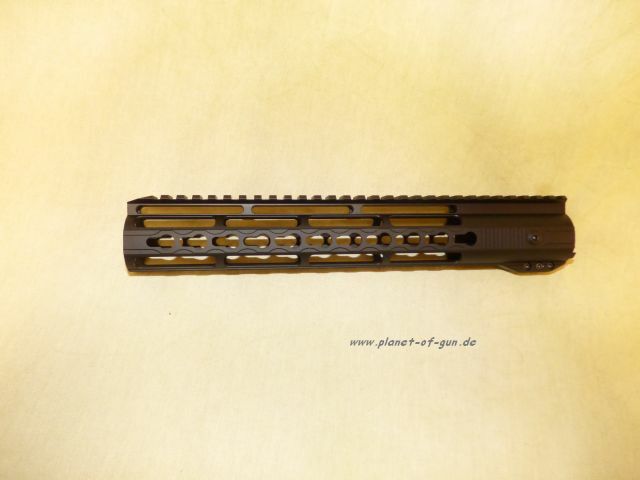 The number one request was to make a thinner handguard. 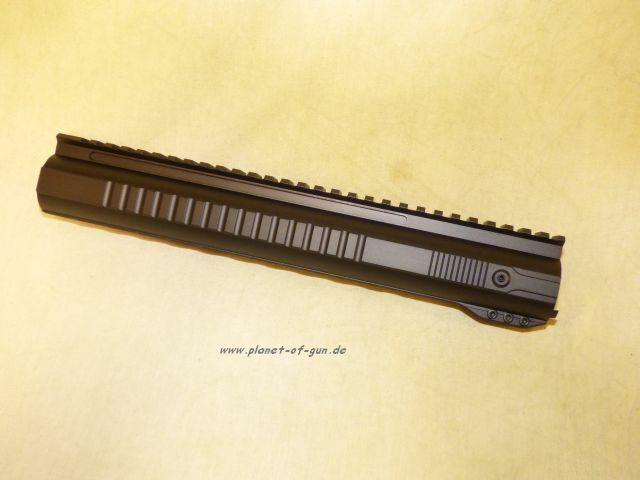 The second most common request was to design a handguard that would accept most aftermarket piston systems. The new profile of the SLR allows for most piston systems to be used while maintaining a top rail that co-witnesses with the upper receiver. The top rail was redesigned so that when installed it creates one continuous picatinny rail between the upper receiver and the handguard. 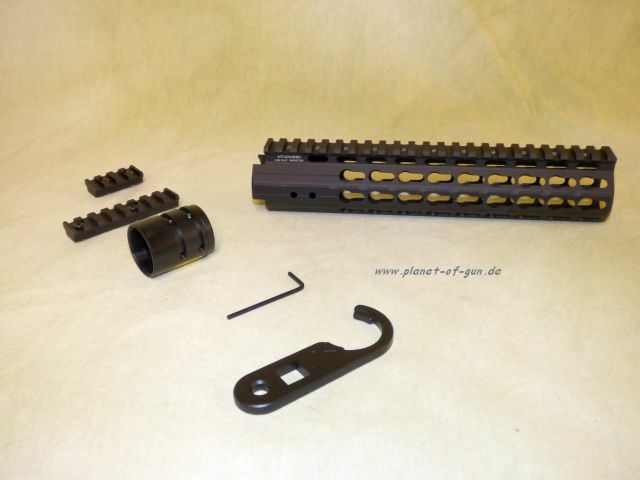 Also redesigned is the method for attaching the handguard to the receiver. 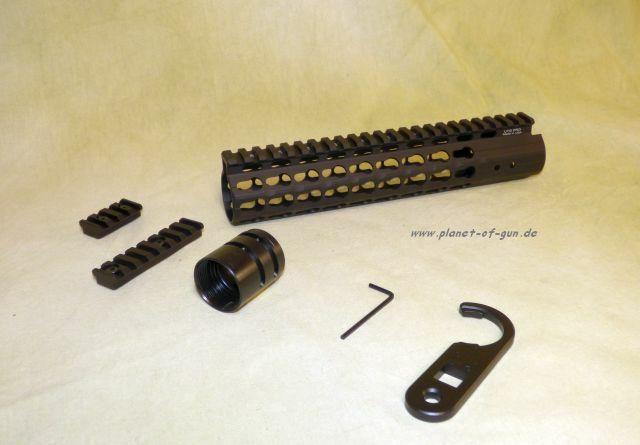 SPECS: Includes black anodized aluminum rail, SLR wrench, barrel nut, clamp, 5 attachment screws and instructions.